Many visitors have asked us if there is an app available for our calculators. 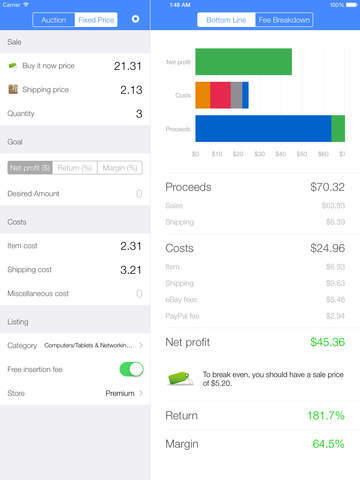 Today, we’re excited to announce the release of our first native mobile app, Salecalc for eBay! Just like the web version, Salecalc for eBay will calculate fees and profit from a potential eBay sale, including associated PayPal fees. You can choose from the many available listing and upgrade options to see their effect on overall profit, and also find the sale price that will bring the profit you want. 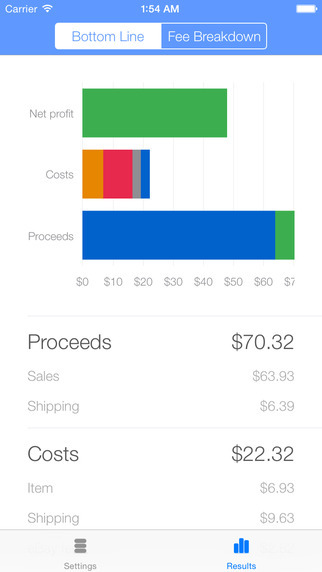 Salecalc for eBay is free and will work on iPhone, iPad, and iPod touch. This entry was posted in News and tagged app, ebay, ios, ipad, iphone, mobile on November 15, 2014 by salecalc.com.